Recapping 2015: July and August. Finally another year in review post! Finally I am sitting down to write another detailed throw-back/recap post for my 2015 year in blogging. We last left off with June. You can also read April+May here, March here and January+February here. July and August of last year were a little unusual and off months for me. See, there were a ton I had to do, a lot of people to see, places to visit, things to get ready for, another vacation and my big upcoming trip+flight back to Michigan. Over 75 outfits were worn during these two months but not even half of them were blogged. I had several other blogging buddies who helped me during these hot Summer months. They took turns guest posting for me. In today's post I am highlighting some of my favorite looks from these Guest Bloggers, too. July was not only a super busy month for me but also a very hot month. My cousin from Michigan visited Albania that month so we got to see him and his new fiance a few times. I also managed a few date nights with my husband and some dates with girlfriends. I have no idea how I managed to get together 23 posts in July. I showed you guys 23 outfits altogether, too. But every now and then there was a Guest Post or two, also. For example, Jill showed us three ways to wear a Chambray Shirt (shown below), Anna did a recap of her dressy, put-together Pregnancy Style (shown below) and Lauren showed us many outfits in a post full of tips on Pattern Mixing & Layering. July saw several Short+Flirty Skirts on the blog, most of which were styled with simple tanks and tees. You saw a couple of Navy Rompers, a few Hats, a couple of Maxi Dresses, my B+W Ikat Shorts and of course lots of Sandals, especially my Kelly Green Sandals who were on repeat. And of course, paying my tribute to USA, I did a lot of Red, White + Blue. Even a Flashback Post with lots of the patriotic colors, for America's birthday. Speaking of Blue, my Trusted Denim Jacket was remixed three times, during July's Style Posts. Out of all my style posts, I did 6 two-fer posts (1, 2, 3, 4, 5 and 6). Sweet Vivian joined me in her own style posts three times (mint floral tutu skirt, seersucker gingham dress and fuchsia ruffled tee). In a post, I also recapped the outfits I remixed while on my Beach Vacation in June. Besides my Summer Style, I shared with you a yummy pasta recipe. In July, I found time to do a Currently post updating you on things I was currently doing like what I was grilling, listening to, etc. It was a very busy month but a fantastic month full of great memories. My Favorite Post and my Favorite Outfit of July 2015. I like to start off each recap with my favorite post from that month. Coincidentally, for July this was both my favorite post and my favorite outfit of July 2016. I wore this Gold Silk+Crushed Velvet Babydoll Dress for a Dinner Date Night I had with my husband to celebrate our 10th Wedding Anniversary. Yes, 10 years is a big deal. So, without our little one in tow, we skipped home for a couple of hours and enjoyed a nice relaxing dinner in one of our favorite restaurants (on the patio). I ended up loving what I wore and my husband did as well. This gorgeous dress paired so well with my bow lace peep-toe pumps too. And I completely straightened out my hair, too. Since we started off July with the Top 1 Outfit we will go in order (I usually start in descending order). For this post we will go in ascending order. 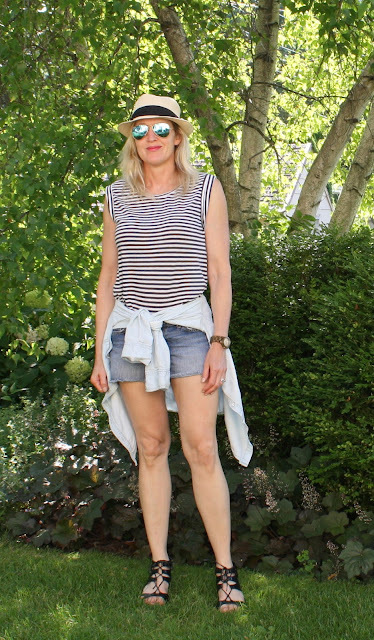 My Favorite Guest Post Outfits from July 2015. Jill does casual, every day looks like no other. Here she is in my favorite outfit she styled for her Guest Post. This casual denim+stripes outfit is simple yet badass. I want to try it this upcoming Summer. Ana took no prisoners last year, while styling her baby bump. 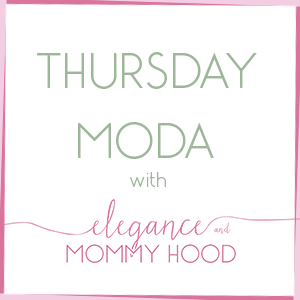 I loved the Guest Post she did for me where she highlighted some of her favorite maternity looks. The one above is my favorite because her soft pink dress is so pretty and she styled it in such a lady-like way. Even better that the dress hinted at the fact that she was expecting a baby girl. August was the craziest and best Summer month of them all. A bittersweet month as I said Goodbye to friends and family in Albania and said Hello to friends and family in Michigan (USA). I started the month off beautifully in Albania and I wrapped up the month vacationing by Michigan Lake near St. Joseph. I don't even know how I posted 18 times in August. However, I only managed to show you 8 of my outfits altogether, and one was a two-fer post. At least half of the 18 posts were actually Guest Posts and I had scheduled them ahead. I wanted to take some time for me between all the packing, the flying, the jet-lagging and just getting comfortable and getting settled back in Michigan. Since I flew back home to MI I had two bloggers (Michiganders) write some fun posts about Michigan. Amy talked about her Favorite Michigan Places like Frankenmouth, while Whitney talked about her favorite Michigan town St. Joe's. Coincidentally I visited St. Joseph and Whitney (both for the first time) later that August, while in early September we made a trip to Frankenmouth. Other bloggers that stopped by my blog were: Jennie defining her style via Fun Shoes, Polka Dots, etc., Alex explaining her Street Style, Carrie styling a cute casual outfit with one of her own DIY Tassel Necklaces, Alena looking like a Greek Goddess and Rachel who did a Mommy+Daughters Style Post. I also had three bloggers doing different remix posts. Shea showed us 2 different outfits with her Rust Patterned Shorts (pictured below), Laura showed us several ways she had styled her Ikat Shorts (which I also own) and Whitney did another guest post - the 6 Remix (pictured below). As you can tell by my few Style Posts, I had Pretty Floral Dresses a lot, in mind. In an Outfit I even took a cue from Japanese Geisha Ladies. And apparently I was enamored with shades of Blue and shades of Yellow as well as Maxi Skirts that month. In one of my style posts I co-hosted Confident Twosday with Laura and later that month I co-hosted with Ana Luiza and Michelle their new (at the time) Monday Linkup "Start the Week Off Stylish" where we each styled Rompers/Jumpers. My cutie Vivian was part of the blog twice (she styled a navy+white polka dot dress, and a fuchsia+white floral dress). Since we left for vacation by Lake Michigan during the last week of August, I did a little recap on what to pack. I also did a Currently post talking about what I wish-listing and more and last but not least, there was a Firmoo Giveaway Collaboration. Despite being extremely busy, it was a great month on the blog, too. My Favorite Post and my Favorite Outfit of August 2015. Just like in July, this post is tied for both favorite post overall and favorite outfit. Because let's face it, this Silk Red Rose Pleated Dress is stunning. It made me feel so happy wearing it and pairing it with pearls and bright accessories, too. This outfit was back from July and it also reminded me of a long but beautiful day I had out and about with Vivian (who was wearing her own bright floral dress). My little girl played with a bunch of her friends and other little ones she was leaving behind in Albania, in a local outdoor playground cafe. My Favorite Guest Post Outfits from August 2015. Whitney chose 6 favorite Summer pieces to do the 6 Remix for her 1st Guest Post. 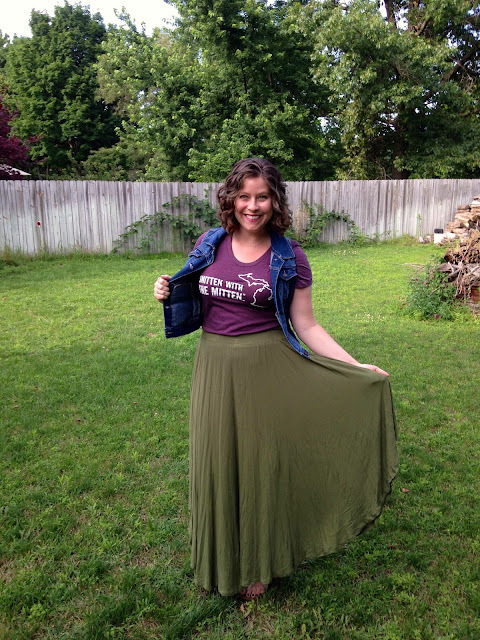 I happened to love that olive maxi skirt of hers and the outfit above where she paired it with the home tee - which shows her love for Michigan - and then a denim vest on top, was so cute and fun. Shea also did an excellent job remixing these adorable rust patterned shorts. My favorite outfit between the two looks she showed on her Guest Post, was the one where she mixed patterns with the classic, sleeveless striped button-down. And of course coordinating with her adorable Jona was a bonus. So, which of these outfits are some of your favorites, too? Patti, Rachel, Rachelle, Sandy with Kileen, Saumya, Whitney and Zaz.